Film history has been both kind and cruel to the Lumières. Yes, the French brothers are assured their place in the pantheon of cinematic pioneers--their names, and the minute-long slices of life they commissioned and directed, appear whenever the milestones of cinema are discussed. Auguste and Louis Lumière’s mastery of the cinématograph, a film camera that could also project and develop film, pointed the way to a new century dominated by the movie medium. But the Lumières believed otherwise. It was still-photography that interested them most, not movies, and by 1903 they were out of the business altogether, focusing their considerable business acumen on other ventures. And so two of the founding fathers of film can seem, to us, like deadbeat dads, leaving behind a trove of little films. There is a tendency to place the Lumières on one pole of cinematic development, opposite the pure creative drive of their contemporary, Georges Méliès, whose 1902 film, A Trip to the Moon, remains famous today, and to whom the Lumières refused to sell a camera. Méliès was the dreamer and artist; the Lumières, businessmen and scientists who preferred their cinematograph to be used for sober purposes. The Lumière Brothers’ First Films, a Kino International DVD release, provides us with needed perspective. The disc holds 85 films, some of them very unlike the actualitiés (documentary footage) for which the brothers are best known. And, it turns out, the actualitiés are also more than they seem. Narrator and French director Bertrand Tavernier spends most of his time analyzing the composition of a Lumière shot, and let me tell you, I never fully appreciated the degree of artistry with which the Lumières and their cameramen positioned a lens. Their camera may have been primitive, but like all great photographers, the Lumières knew that scenes of everyday life could generate immense power if captured just the right way. All this makes a long introduction to Washerwomen on the River, my favourite of the Lumières short films on this disc. Like almost all their work, it is a single scene of about 60 seconds; like most of their work, the camera stays perfectly still; and like very little of their work, it has really stayed with me. The cinématograph, shooting on a river bank, presents a scene on the opposite shore—a scene split in three layers. On the bottom, burly washerwomen scrub clothes in the water, which reflects their rapid labour; above them is a grassy hill leading to the road, unpopulated except for a trio of men, doing nothing, on the far right. The top layer is the road, a thin strip across which headless people stroll and horse-drawn carriages clatter on their way to other business. Where to begin? Tavernier cracks wise about the golden age of French history, when gentlemen were free to do nothing, but that’s only the most literal take on Washerwomen. The key to the film—the core of its art—is a trick of perspective. The grassy bank on which the men stand recedes toward the road, but the composition of the scene makes you believe the three layers are evenly stacked. This makes the men look, at best, a third the size of the women below them. It’s perfect; worthy of an Egyptian wall painting or medieval tapestry, in which size denoted importance. But in this case, the puniest are the most privileged. Washerwomen is good comedy, too. The men in it are so inactive that, at first, you wonder if they’re real. Then, at the 30-second mark, one beckons to his friend and points--to the camera across the lake! Finally roused to the measliest action, the men remain unproductive, while the women relentlessly scrub. None of them see the lens. Whatever conclusion you take from Washerwomen, it will be uncompromising. The film’s lines are straight and clear—not the blurred boundaries of a natural system, but the rigid demarcations of an artificial one, and so its arrangement, however we might interpret it, is created in-camera. In ‘real life’ the layers are not sitting atop one another at all, and so, in real life, they aren't layers. A single, documentary scene from a fixed camera, as purely didactic as any I’ve watched before—that’s damn heavy stuff, especially from a couple of businessmen. 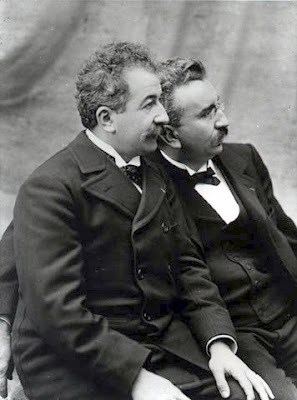 The Lumière Brothers’ First Films is out of print, but here’s a starting point for you.